Just a quick event-related update this week: I'm lucky enough to be one of 35 invitees from around the world attending Nokia Open Lab 2008 in Helsinki, Finland. 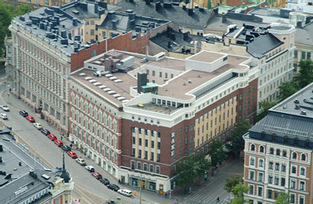 The Nokia Open Lab 2008 event and its related workshops are held at design hotel Klaus K's Rake Hall, located in the heart of Helsinki. It's being sponsored by both Nokia Europe and WOMWorld, a Nokia-focused mobile technology blog. The event is centred around the future of mobile technology and the influence of the social web and community building in the development of upcoming mobile devices. We at Taunt were very pleased to be contacted by WOMWorld with respect to attending the workshop back in August, due to his experience with community building and social media-based applications. Personally, I'm really looking forward to attending and meeting other mobile technology and social media afficionados from around the globe. More information about the event is available over at my personal blog, where I'll be blogging (and tweeting) about my experiences at the Open Lab and around Helsinki later this week. Photo courtesy of Stefanos Kofopoulos on Flickr.